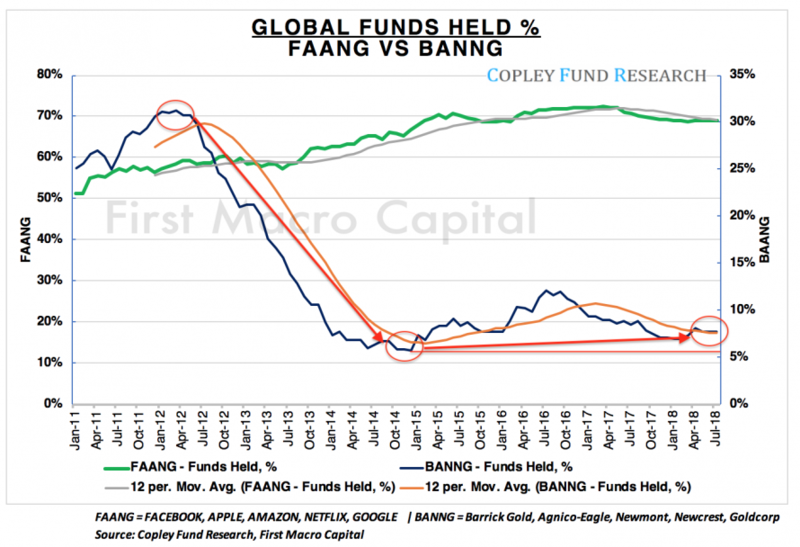 When looking at the 270 Global Equity Funds, with ~480 billion in AUM, we have seen the number of funds owning FAANG’s risen from 1 in 2 (51.4%) to 7 in 10, but the number of funds holding FAANG’s has been drifting down since April 2017, when it was 72.38%, but not by much to 69% at the end of July 2018. They have been clearly selling into the rally as retail investors continue to hold on. If capital continues to flow into the US, Newmont Mining has an edge over the other BANNGs, because it is the only company that is in the S&P 500. No other BANNG will be able to do this unless they change to being domiciled to the U.S.
Over at Barrick, Executive Chairman John Thornton is taking a non-traditional approach to the gold sector, focusing on profits over production ounces. He is taking his non-mining background and focusing on creating a consistently profitable business, with the aim that many of the diversified miners have done. Mr. Thornton doesn’t have to follow the standard norms or practices as to what has been in the past, potentially setting up the company to outperform its peers as its taking an unconventional approach. We think its welcomed. “(Thornton) doesn't have the DNA of a mining manager, or a mining family industry executiv (National Post). We would counter, that the one thing counts for shareholders, and that is delivering shareholder performance over anything else. If he is able to deliver on earnings, the share price will follow. 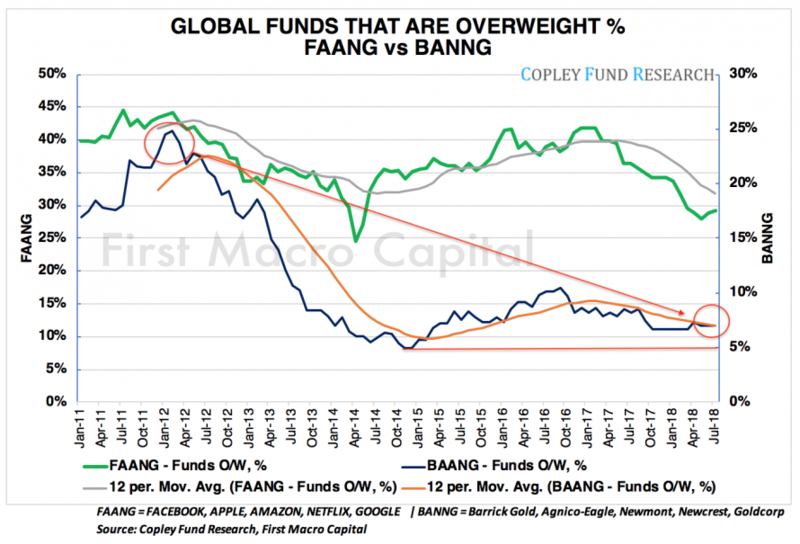 The contrarian view over the next 2-3 years puts the odds in favor of BANNG’s outperforming FAANGs, as FAANGs come under political pressure, typically highlighting the end of a sector run. Global Equity Fund Managers are light on BANNG’s, so those positioned with a view over a 2-3 year time horizon will be able to capitalize on fund flows back into the sector. While governments are opening up to miners to expand in their countries to create jobs as we have seen in Canada, Brazil, and the United States. 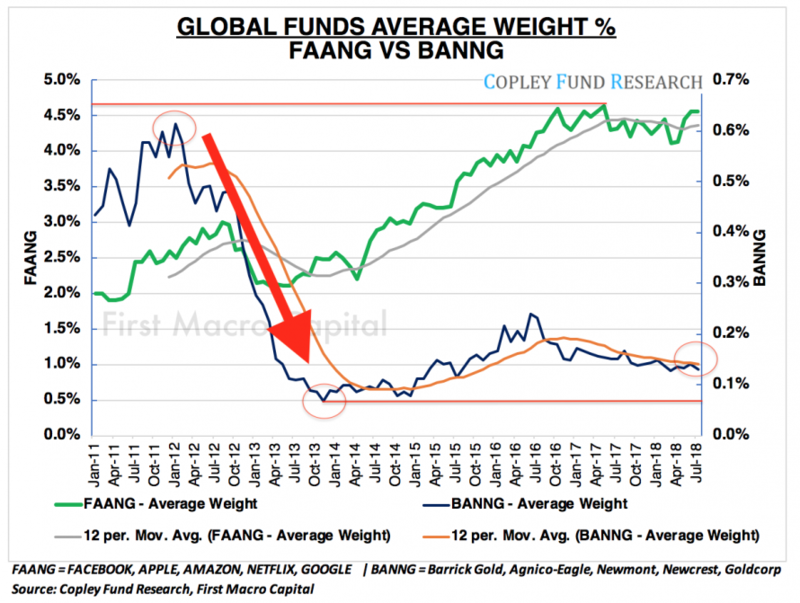 The Risk-Reward for fund managers presents an opportunity shift from FAANG’s to BANNG’s with better asymmetric opportunities. We think this is the beginning of BANNGs versus FAANGs as we see a sector rotation into materials and FAANGs comes under political pressure, a common occurrence at the end of a sector cycle. We will be hosting a Live Webcast on Thursday, August 23rd 19, at 8:15 PM ET. Paul Farrugia, BCom. Paul is the President & CEO of First Macro Capital. 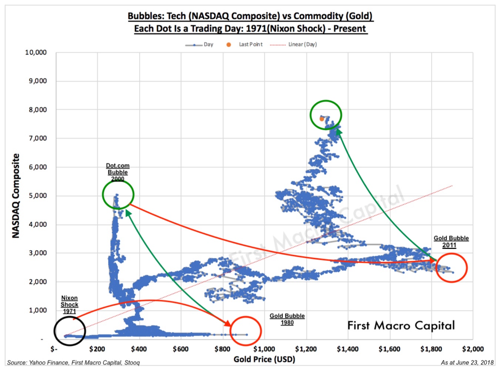 He helps his readers identify mining stocks to hold for the long-term. He provides a checklist to find winning gold and silver mining producer stocks, including battery metals. Data powered by Copley Fund Research.